Only because its best that you do; for more reasons than one. While renting things is common practice, more often than not, people in businesses tend to go the other way – that is, they are under the impression that purchasing should prove a better option. Thus, they end up spending a fair amount of money on just this one, one of the many phases, of business (i.e. Procurement/Acquisition of goods). If you are in business, one of your primary concerns should be to balance the cost and profit. In that regard, it is ideal to rent equipment instead of buying a new one. We list below few of the reasons renting is the way to go when it comes to equipment like photocopiers and printers. Stable Cash flow – It is really a no brainer that rentals of any sort seldom require down payments. With that said, renting equipment, essentially printers, photocopiers and other products along those lines, can facilitate you in maintaining a stable, more consistent (to an extent) cash flow. There aren’t as many dollars flowing outward as there are in purchasing. It is really a “no strings attached” kind of a system. No upfront payments, no undesirable activity in the cash flow. Easier to keep up to date – Contrary to the position you are put in when you purchase a piece of equipment, renting one arms you with the ability to upgrade as per your liking. While when you purchase something, you are stuck with it till the end of time, renting for whatever period of time allows you to switch to better, more advanced, more sophisticated and up-to-date alternatives that have just come into being, upon the expiration of the lease. Photocopiers, Multi-functional printers etc. In particular, are more constantly updated and so, it is best to not get stuck with one but keep room for updating. Foreseeable monthly expenses – When you rent a piece of equipment, you have a pre-determined monthly line item, which can help you budget in a more organized, systematic and effective manner; thus enabling you to focus your budgeting abilities on other areas. No hassle service: Finally no worries if your printer on lease or rental is broken or needs a service. The rental option makes sure you are fully covered if at all your printer needs repair or service. Complete peace of mind and that too without buying one. Given the significance of computer equipment rentals, copier rentals and, more presently business printer rentals are very easily available in all places. There is no denying the fact that leasing involves a little more paperwork when compared to purchasing, where you pay from one hand and receive the product from the other; nonetheless, all in all, it is worth all the hassle you will relieve yourself from. Who says you have to be stuck in a time warp with outdated equipment? 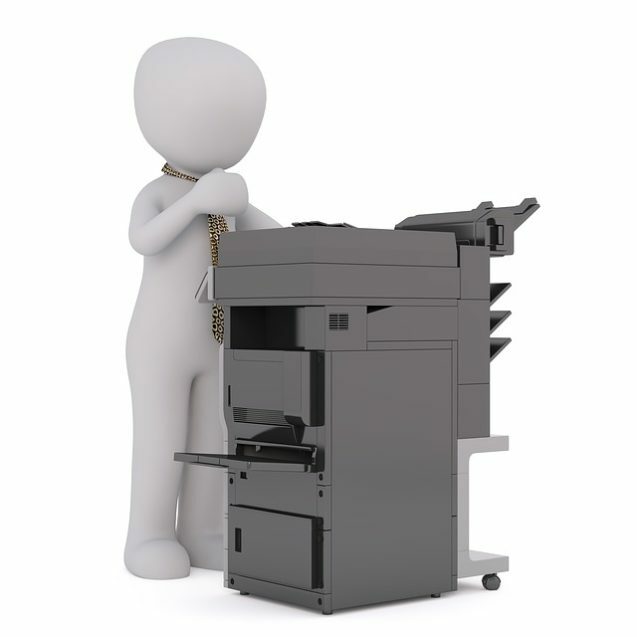 You can simply rid yourself of the misery by renting your business printers. Convinced yet; Contact us if you are looking for Copier Rental or repair of any business printer. We have all type of Business printers for rent or lease. It’s a win win situation.